Whoopie pies are soft, cake-like cookies that are sandwiched together with a frosting-like filling. 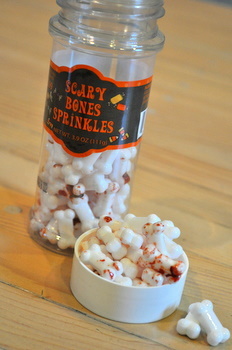 If you haven’t had them before, they’re almost like inside out cupcakes in terms of texture and flavor. Whoopie pies are easy to make and easy to transport, so they’re a great snack to make when you need to feed a crowd or want to take a treat to a party. Chocolate whoopie pies with a vanilla filling are the most classic flavor, but there are endless variations on this idea, like these Pumpkin Whoopie Pies with Salted Caramel Filling. 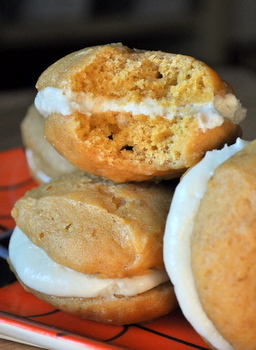 Pumpkin cookies make a great base for whoopie pies because the pumpkin keeps the cookies soft and moist, resulting in a much more cake-like cookie than some other recipes and yielding a softer whoopie pie in the end. I like the cinnamon, ginger and clove spices of pumpkin pie spice that end up in the cookies, but the cookies are still a little bit plain on their own and I wanted to make sure that I got some more flavor into the pies. I ended up adding some salted caramel to the buttercream filling to add some sweetness and another layer of flavor to the dessert. I used a bit of homemade caramel sauce I had leftover in my fridge, but you can use storebought caramel sauce if you have some on hand, or keep an eye out for the Fleur de Sel Caramel Sauce from Trader Joe’s and use that. 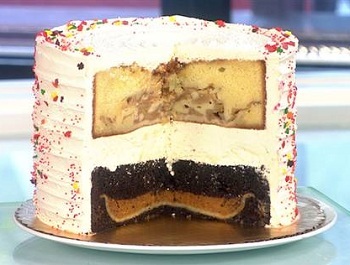 The result is a great combination of flavors and a very addictive dessert! These whoopie pies are moist and cake-like, with a relatively sturdy cookie that is easy to handle when frosting or filling. They will puff up as they bake, so make sure that you either round your dough balls very well or gently flatten them a bit to round off any rough edges, to ensure that you get smooth-looking finished cookies. Be generous with the filling and allow the filled cookies to set up at room temperature before serving them, so the filling has time to adhere to the cookies and won’t simply ooze out of the sides. The cookies themselves can be made a day in advance and kept in an airtight container before filling. The filled cookies will keep, in airtight container, for a few days but are best within 2-3 of days of baking. Preheat oven 350F. Line a baking sheet with parchment paper. In a large bowl, cream together the butter and sugar until light. Beat in egg, followed by vanilla and pumpkin puree. Add flour mixture and stir until just incorporated. Drop by 1-inch balls and bake for 12-14 minutes, or until cookies are set. Beat butter in a medium mixing bowl until smooth and creamy. Add in milk, caramel sauce, salt and vanilla extract. Gradually blend in sugar at medium/high speed until a thick, spreadable frosting comes together. Add more confectioners’ sugar gradually if frosting is too thin. These look amazing! If you used TJ’s Fleur de Sel sauce would you leave out the extra salt noted in the recipe? I can’t wait to try this one. I am going to add this to my whoopie pies to make list. Linda – Yes, I would. can i do a chocolate filling for this one? didn’t know pumpkins are also used as base for cookies. i would love to make this cookies for the trick or treaters this halloween. 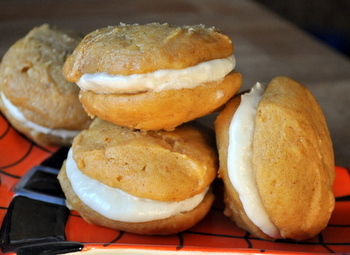 Love your variation on the typical whoopie pie–I bet the sweet/salty combo is fabulous! I made these over the last two nights (cakes one night, the filling the next) and OMG these are to die for! They’re so, so good! Everything turned out great, and I like that the 1″ dough ball size results in smaller whoopie pies than what’s normal in PA Dutch cooking – those were always far too big for me, but yours are just right!